Toxic substances, nutrient shortage, viral infection, heat and many other events trigger stress responses in cells. In such cases, the affected cells launch a programme which tries to protect them against stress-related damages. They usually ramp down the production of endogenous proteins to save resources which they later need to repair cell damages or to survive under the stress conditions for some time. Stress granules are a visible sign of such stress reactions: The small granules consisting of numerous proteins and messenger RNAs build up inside the cell when protein production is suspended. Once the stress is over, the cell takes up its regular operation again and eliminates the stress granules. But if this clearance process does not work according to plan, serious consequences can arise. Recent studies show that stress granules are suspected to at least contribute to two incurable neurodegenerative diseases: Amyotrophic lateral sclerosis (ALS), which causes muscle atrophy and lethal palsy in its final stages, and frontotemporal dementia (FTD), the second most common type of dementia in people under the age of 65. The scientists from the Biocenter of the University of Würzburg have now uncovered new details of the clearance process of stress granules. The study was headed by biochemist Professor Alexander Buchberger. The lead author is Ankit Turakhiya. Other contributors were Professor Andreas Schlosser from the Rudolf Virchow Center of the University of Würzburg and Professor Kay Hofmann (University of Cologne). The scientists present the results of their research in the current issue of Molecular Cell. "We were able to demonstrate that the ZFAND1 protein is necessary for the normal clearance of the stress granules. When ZFAND1 is absent, some granules cannot be dissolved and change their structure as a result. 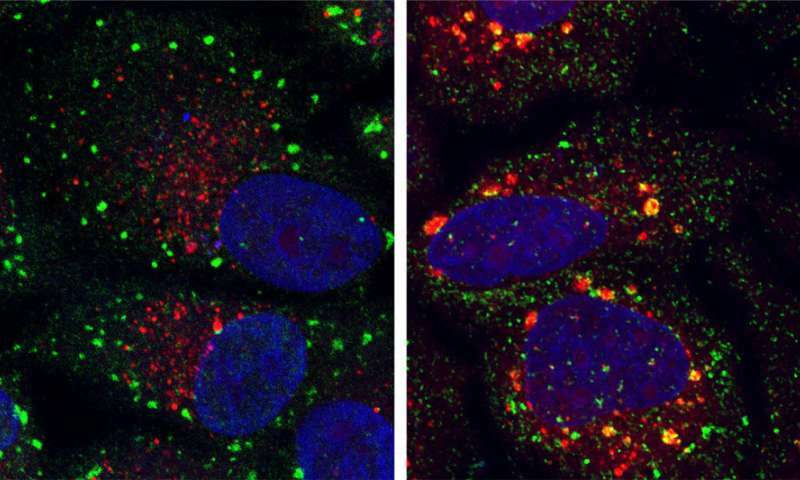 These abnormal stress granules then have to be disposed of by autophagy, the cellular waste collection service, in a complex process," Alexander Buchberger sums up the central result of the new study. However, ZFAND1 does not directly impact the elimination process. Instead, it recruits a special enzyme complex required to eliminate defective proteins, the so-called proteasome, bringing it together with the stress granules. Buchberger explains that they had been surprised to find that the proteasome plays such a prominent role in eliminating the stress granules. He says that until now researchers had assumed that defective proteins at stress granules are eliminated together with the latter by autophagy—an assumption the biochemists were able to correct in their study. What may appear to be mere fundamental research with little practical relevance to the layperson is in fact highly relevant for medical research. "The accumulation of abnormal stress granules is considered to be a potential cause of neurodegenerative diseases," Buchberger explains. He therefore believes that it is vital to clarify how stress granules are formed and eliminated in order to better understand the pathogenesis of these diseases and find potential targets for treating them. In a next step, Buchberger and his team are planning to analyse the composition of stress granules in more detail and to identify the defective proteins that need to be removed by the proteasome. Their overarching goal is to shed light on the regulatory processes involved in the creation and elimination of stress granules.